The Wampanoag, also known as the Massasoit or Wôpanâak, are a Native American people group who predominantly belong to the federally recognized Mashpee Wampanoag Tribe and the Wampanoag Tribe of Gay Head (Aquinnah) of Massachusetts. A smaller percentage are part of four state recognized tribes in Massachusetts which include the Assonet, the Herring Pond, the Pocasset (Pokonoket), and the Namasket. Their name, Wanpanoag, means "People of the Dawn." The Mashpee tribal band with a membership of over 1500 is located in the town of Mashpee, the Barnstable metro area. It is also Mashpee Wampanoag Indian Museum. 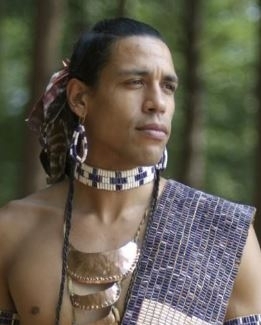 The Wampanoag Tribe of Gay Head (Aquinnah) tribal band claim a membership of over 1100 with approximately 300 residing on Martha's Vineyard, 120 residing in the town of Aquinnah, which is on Martha's Vineyard, and the remainder are scattered in the United States. They spoke Wampanoag but now are speak English. Since the 1990s they have sought to revive the language. Today a few of those trained can converse in Wampanoag. They continue to provide training and instruction in the Wampanoag language. Watch a short CBS News video on the Wampanoag Language Revitalization. Historically, the Wampanoag are well-known as the Native American people who the pilgrims originally encountered. From that encounter, the American national holiday Thanksgiving Day arose. Traditionally, the Wampanoag adhered to a religion known as Spiritualism. Even today, many still adhere to and practice such beliefs. For instance, the Chief and Medicine Man remain traditional members of the Wampanoag Tribe of Gay Head, serving for life. They share the belief that the giant Moshup created Noepe and the neighboring islands, taught their people how to fish and to catch whales, and still presides over their destinies. The Stories of Moshup Pageant, held each August, honors and reenacts the stories of Moshup’s life, weaving narration, music and acting into the traditional performance. Nevertheless, Christian missionary presence is well documented among the Wampanoag. The first Bible published in the colonies was a translation into Wampanoag by the missionary John Eliot in 1663. Pray God will work in the lives and hearts of Wampanoag people to understand and accept the Gospel of Jesus Christ for their own people. Pray Christians will exemplify a life on missions in word and deed among Wampanoag people. Pray evangelical Wampanoag will boldly share Christ, grow in their faith, and exemplify Christ both in word and deed.